Miso is not something that should feel intimidating to make. Miso is a fermented soybean paste (occasionally rice or barley) used to season everything from broth, marinades and salad dressings. You can find miso paste in the refrigerated section of Asian markets or usually in the health food sections. I once got hold of a book which attributed the lack of fall out poisoning in Hiroshima to their diet of miso. You’ve probably already heard of the benefits of live culture in yogurt, basically it is the same in miso. 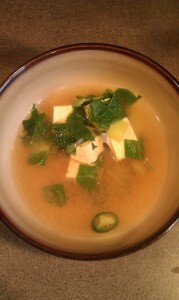 Miso is a living bacteria and should not be boiled hard or long. It is added toward the end of cooking and just dissolved or heated through. Most people would not use a recipe for spaghetti sauce, and miso soup really can be made the same way. You throw some vegetable broth in a pan, a diced green onion, a few cubes of tofu and some cut up nori (seaweed,) heat it and add a tablespoon of miso. In the miso book above, they put it in every kind of soup. However I found a nice version of miso this weekend which I will continue to use. I adapted it from one of my favorite cookbooks, the Soup Bible. 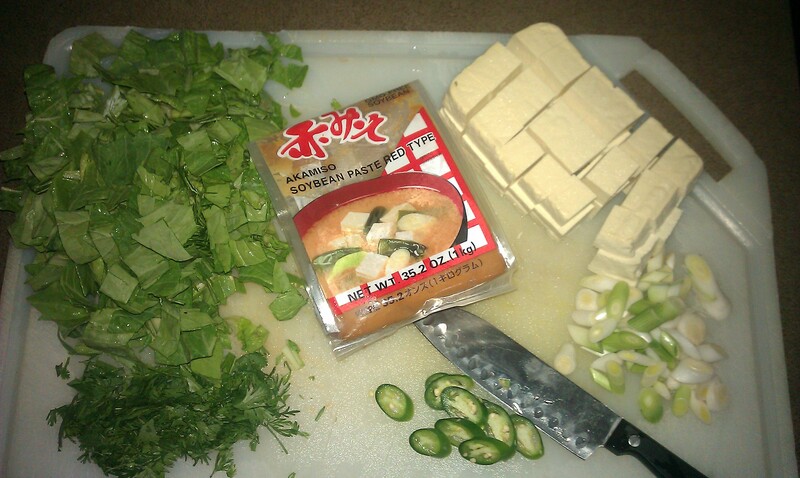 Finally, take a little broth out and place it in a bowl with 1/2 cup of Red Miso paste. Stir to dissolve and add to the soup. You are ready to go. The delicate fish-flavored broth with a hint of spice and cilantro was such a delightful surprise. Ours was especially delicious because I was able to pick the leeks, bok choy and cilantro from our garden just before. I am definitely going to hang on to this rendition when cold season comes around again. The soup is more filling than it looks but you can serve with rice or as an appetizer. Makes about 10 cups.